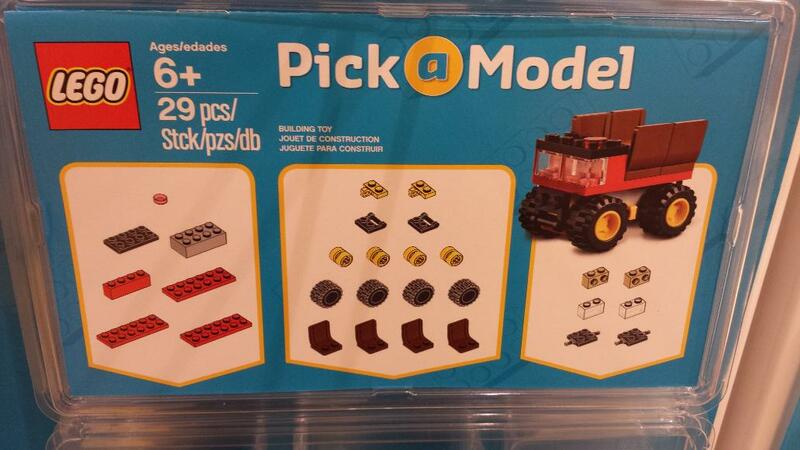 Odd they are showing brown chairs on the truck in the instructions but white on the built model. Thanks for adding these, always great to see what's coming to the PAB walls. Do these come with instructions? And are they anywhere online I could print them? The insert in the plastic pack is a book that has the list of pieces and the instructions. 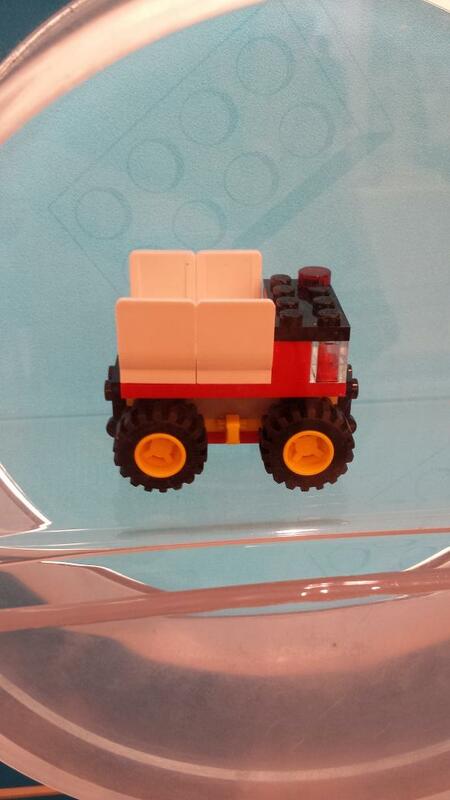 I haven't seen any of the PAM instructions posted online by Lego. Thanks for the picture!! I understand them not putting the current ones out, I mean that's the only reason to pay the $5 IMO, but I wish they would post the old ones like all the other sets. I was playing around with LDD and was able to build the models from the pictures I took and generate some HTML instructions. I included the LXF files for LDD in case anybody wants to modify them. A large container could probably make 10 pandas for $18 (?)! 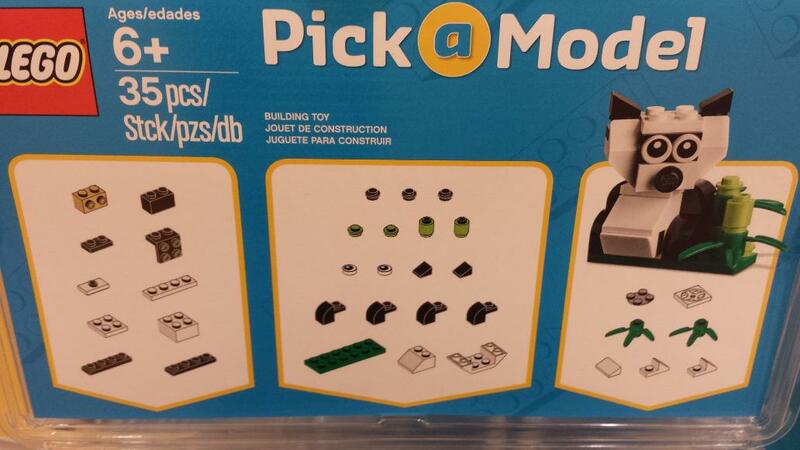 ^I easily fit 8 Panda's into my large PAB cup, I'd almost lean towards 12 as a possibility. 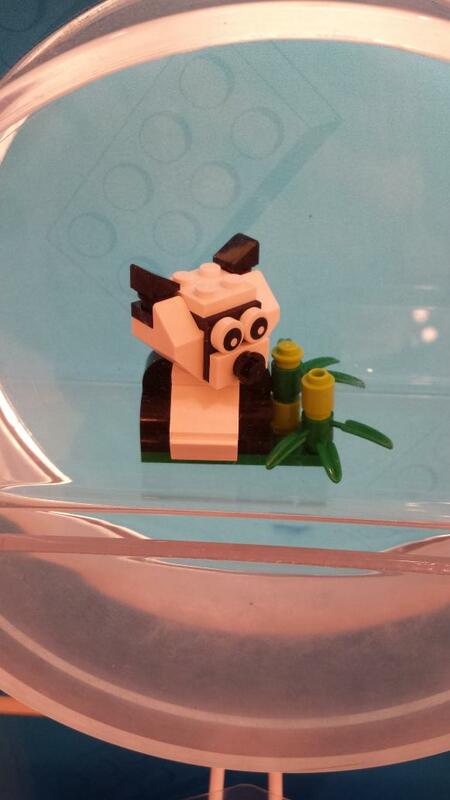 It appears that since my Lego PAB wall is about the smallest out there I only get the Panda model. so MMV. the parts for some of these minibuilds have been great! I've needed about 500 black cheese slopes for a moc for about a year, but have fought off the urge to order on bricklink at 3-5 cents per. Now I was able to not only get those, but a few other pieces in bulk that I've wanted for mocs. Sorry if certain pieces get bought up over a weekend, but certain parts will disappear in bulk - as to be expected. One lady got mad at me, and tried to insult me by calling me a reseller. Um, 1/4 a cup of cheese slices doesn't keep a reseller in business. I happily told her that I needed the pieces for a train project. I wasn't looking for a conversation, but she kept talking to me. I guess my look of "They have the piece I want. Let me be in my own little world" somehow translated into "Want to hear about my collection!" In the end, glad to see black cheese slopes, and that 1x2 plate with the white cheese slope (found on Panda ear). Have wanted that one for a roof line of another moc for a while. I did notice that the yellow tire rims don't stay in stock. Interesting. ^ I have had the opposite experience. Before these models, I was able to find pieces I needed for projects. I have not been able to find anything since they have started these. I also feel there was more variation in terms of color before this change over. I have not bought anything from the PAB wall since. I am glad you found the piece you needed, though. While Im not a fan of these mini models taking up like 8-10 bins I do find that most models have at least 3-4 part types I would not mind stocking up on (at least, parts I have not seen before in the wall). It is a bit amusing that someone resorts to calling anyone buying x of a part a reseller though. I think some people have too much time on their hands. I also know that the folks that work at the store I frequent do discourage anyone from trying to empty one bin of a certain part of they know that it is for a mini model that is to be constructed. Though it would be interesting to see a 1x2 masonry brick appear in a build and see how best they can restrict people from trying to buy up the bin on that part. I feel bad for the store staff. First, they lost control over all PAB wall ordering. Previously they had a fairly decent list of items to choose from, and could order accordingly based upon inventory levels, what moves in the store in general, and even special box orders for customers. Now they get sent whatever LEGO wants to send them. Then it gets even worse with this PAM stuff where they send highly desirable parts in limited quantities and put the store staff in a no-win situation of trying to be the "wall police"
When they first changed this policy, I was filling a small container with 2x2 grey tiles, the manager of the store (who knows me by sight) came over and politely told me that those parts could not be purchased in bulk because they were part of the model. I apologized and he asked me if 2x2 tan tiles would suffice. I said yes and he brought me a large PAB cup full to the top out of the back and let me have it for free. ^ Honestly I would fill out the customer survey or contact LEGO CS about that. 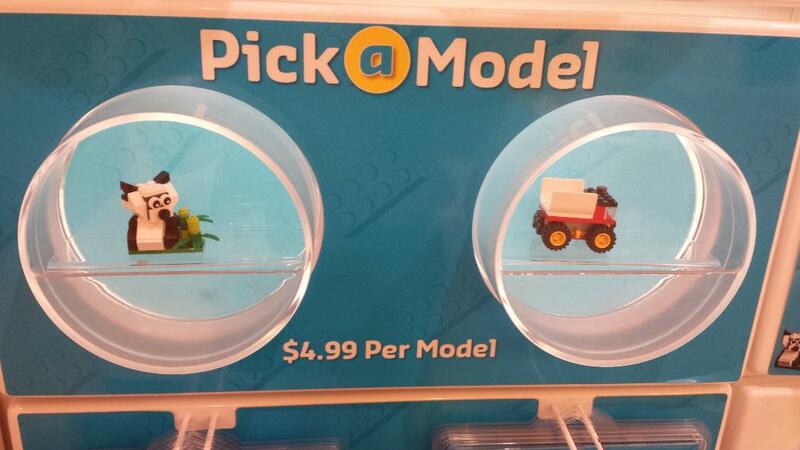 If you have a PAB wall that you can buy parts by the cup, and then not let people buy them by the cup, something is wrong. I haven't had any issue buying cups of the parts used in the models. The only thing I could see a store doing is asking not to clean them out of a part if it is low. 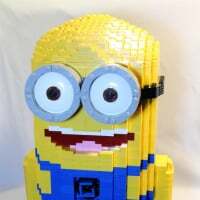 My local store told me that LEGO corporate informed the stores that they cannot allow someone to buy a part in bulk that could stop someone from making the PaB model displayed. Ah, sounded like they wouldn't let you buy any at all, but definitely YMMV. I've gone in the first week of each of the new sets and bought large cups each of various parts. Interesting they are only running one at a time. Possible response to complaints about too many bins being taken by the PAMs, or that one model always outsold the other. Lots of nice pieces in the elephant. LBG 1x2, 2x2 roof tile and 1x1 with stud on the side, DBG 1x2, 1x4. 1x2 roof tile and 2x2 inverted slope. The size of the stores wall determines if the store had one or both of the models. Think they changed that with the second set of models. The store I visit the most is the only of the 4 in the area that only gets one of the models. The store by me had both simultaneously for the first couple of quarters, but only had the elephant this time. I think the display said the elephant was available through February 16th and then the plane will be available. Nashville has both but Birmingham just has the plane. Birmingham is a much smaller store.